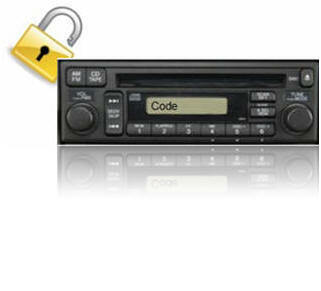 Can't find your factory car stereo radio code? "Proudly serving the automotive industry since 1998"
If you own a vehicle, you may find that the audio systems are equipped with an Anti-theft or radio code feature that requires a special "security code" to unlock your radio. This radio unlock code is not required for normal operations. It's purpose is to deter a potential thief from removing the stereo. If the factory car stereo is stolen from the vehicle, the radio becomes inoperable without the radio code. Operating the unit will require a "secret stereo unlock code" known only by the owner. Disconnected the factory radio harness. Disconnected the battery to the vehicle. Click on your vehicle below to retrieve code now! Orders are processed 7days a week. Orders processed 7 days a week. Click here for instructions how to enter code for your radio. In serving the industry since 1998, many companies in the automotive industry have relied upon our radio unlock code service to get their customers up and running! Now you can get the same great service at radio-code.com! Radio code, Anti-thief code, Theftlock, Unlock code, Security code or Decoding. Thank you very much for your prompt response and excellent service! The instructions given were so easy and I got my radio playing again in no time! I now feel complete, strolling in my Yukon with music to listen to! You really saved the day, thanks again!! To all at radio-code.com. I recently experienced a dead battery in my 97 Mitsubishi Gallant. To my dismay, I discovered that after replacing the battery in my car, the stereo would no longer operate! I discovered I needed a radio code Thanks for the help guys! Vehicles that require a radio unlock code will have a specific procedure to enter the security code. If you already have your anti-thief code and need assistance entering it into your radio, our unlock manuals are a real life saver!